This charming village in the heart of the island has a wide choice of restaurants and bars, offering everything from gourmet cuisine to rustic local bars. At the geographical heart of the island, the village of Santa Gertrudis is Ibiza in microcosm. 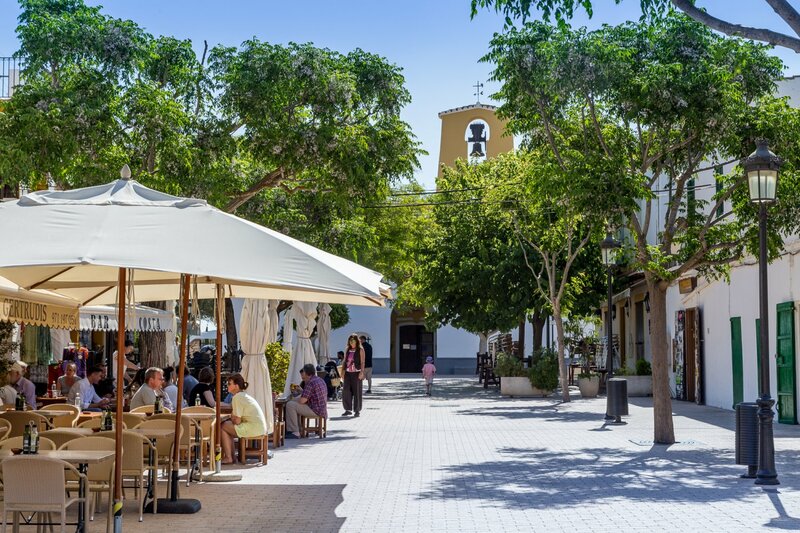 Steeped in tradition, its main square houses the whitewashed church and a cluster of bars, restaurants and shops, whilst in the rich agricultural landscape all around, live sheep, goats and the island's only dairy cows. Santa Gertrudis has expanded rapidly but carefully over the last few years. Smart modern villas now line the new streets, the village square has had a makeover and is now a pedestrian friendly plaza and new, hip café bars and restaurants have joined traditional Ibicenco establishments as the village's eatery scene achieved critical mass. It's also a home from home for many new residents from Europe and beyond who have brought a different, more Bohemian style of living to the village. Many artists, sculptors and musicians have settled here over the years and their works are everywhere – in galleries and most famously in the Bar Costa where penniless artists in the hippy era would swap paintings for food and now hanging art competes with hanging hams for space. Try the Musset Cafe for morning coffee and freshly baked bread; Bar Costa for delicious 'jamón serrano', Manchego cheese and crackling log fires in winter; Es Cantó for traditional hearty fare or for a special meal in the evening La Plaza. And for a special and more exotic experience, just 5 minutes from the village, we recommend Bambuddha, the iconic restaurant temple surrounded by a tropical bamboo garden. Any time of day is just perfect for a visit to the village. With arts and crafts shops, galleries, and an eclectic mix of clothing and accessories there's plenty of retail therapy to be had before and after morning coffee, lunch, afternoon 'merienda' or dinner. Santa Gertrudis is also home to the international book shop Libro Azul, with English editions and a great choice of beautiful photography works. In Casi Todo there are auctions once or twice a month in English and Spanish, where everything from unwanted items, trinkets, furniture, paintings and real antiques are sold to the highest bidder. In the lovely surroundings of Santa Gertrudis there is a great choice of beautiful holiday villas. Try Villa Santa Gertrudis (Ref. 007), a cosy country house in a traditional Ibizan style with wide lawns and a fenced pool - ideal for families.